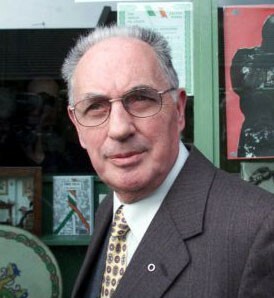 Ruairí Ó Brádaigh (1932-2011) was an Irish Republican who served as the Irish Republican Army (IRA) chief of staff, Sinn Fein president and the founding leader of Republican Sinn Fein. Ó Brádaigh was born into a middle class family in Longford in the Irish Free State. His father Matthew had served in the IRA and named his son Peter Roger Casement Brady after the Irish Republican executed during World War I. Ó Brádaigh was educated in Longford before studying commerce and Irish Gaelic in Dublin. He joined Sinn Fein in 1950 and the IRA the following year. In 1955 Ó Brádaigh was part of an IRA squadron that travelled to England and raided a military armoury in Berkshire. He commanded raids on Royal Ulster Constabulary (RUC) stations during the IRA’s Border War and was subsequently arrested and jailed. While in Dublin’s Mountjoy Prison Ó Brádaigh was elected to the Dáil Éireann as Sinn Fein’s candidate for Longford-Westmeath. In line with Sinn Fein’s abstentionist policy he never took up his seat in the Dáil. Ó Brádaigh escaped from internment in 1958 and became IRA chief of staff, serving two short terms. He was replaced as chief of staff by Cathal Goulding in 1962. Ó Brádaigh reemerged in 1969 after the IRA’s failure to protect Catholics from Loyalist violence and police brutality. He aligned with militants like Seán Mac Stíofáin and Seamus Twomey, walking out of the IRA and Sinn Fein to start a new radical movement. Ó Brádaigh became a founding member of the Provisional IRA and was elected president of Sinn Fein in 1970. In these positions he exercised considerable influence over the Provisional IRA’s military strategy during the 1970s. Ó Brádaigh was forced out of the Sinn Fein presidency in 1983 and replaced by Gerry Adams. He walked out of the party conference in 1986 after Sinn Fein members voted to wind back abstentionism and take up seats in the Dáil Éireann. Ó Brádaigh became the inaugural president of Republican Sinn Fein, which claimed to be the only Irish party holding true to original Republican aims and values. Ruairí Ó Brádaigh held the presidency of Republican Sinn Fein for 22 years. During this period he was a strident critic of leaders like Adams and Martin McGuinness. Ó Brádaigh was opposed to the Northern Ireland peace process and the Good Friday Agreement, declaring it a “sell out” of true Irish Republicanism. 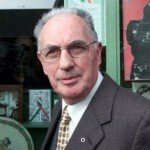 In 1998 Ó Brádaigh condemned the Omagh bombing as a “slaughter of the innocents”, later claiming that dissidents in the Real IRA were trying to “take over” Republican Sinn Fein. Ó Brádaigh’s health declined and he retired from politics in September 2009. He died in Roscommon in June 2013, aged 80. J. Llewellyn & S. Thompson, “Ruairí Ó Brádaigh”, Alpha History, accessed [today’s date], https://alphahistory.com/northernireland/ruairi-o-bradaigh/.